MINNEAPOLIS- First the Seahawks shut down Adrian Peterson. Once Minnesota’s run game found no open holes for their star running back to exploit, they reverted to the pass, which Seattle feasted on. Both the offense and defense had exciting showings in this game. Russell Wilson (21-27, 274 yds, 3 TDS, 9 rush, 51 yds, 1 TD), heated up just before the end of the 1st quarter, and continued well into the 4th quarter before relinquishing the role to Tavaris Jackson. Seattle’s defense kept Minnesota offense to 125 total yards, eliminating the Vikings strong suits, and ramping up the pressure on their QB Teddy Bridgewater, while accumulating 4 sacks and one interception in the process. Wilson was sacked once in this game, and even when he scrambled, found no difficulties rushing for key yards or first downs. The blocking was just as proficient as the game prior, as evidenced by Wilsons 8 yard rushing touchdown in the 2nd quarter. Wilson had a 53 yard rushing touchdown called back due to an offensive holding call, so what did he do? Lob it 23 yards to the fleet footed Doug Baldwin, who tacked on another 30 after the catch. He once again benefited from a gracious helping of targets, for 94 total yards. Tyler Locket caught all seven of his targets for 90 yards, while racking up 47 return yards off of kicks. He would also be involved in a scary defenseless hit situation involving two Vikings defenders, but came away relatively unscathed. Thomas Rawls rushed for over one hundred yards, gained another 22 through the air, and spun furiously into the end zone for a score all of this came after he had a 1st quarter fumble. Fred Jackson caught a passing touchdown from Wilson on the run, while also totaling 20 yards. Even the Tight Ends, Cooper Helfert and Luke Willson, combined for almost 50 receiving yards. Once Wilson made his first cuts into the Viking defense, he refused to relent, and the Vikings paid heavily. The offense racked up 25 1st downs, were 9-13 on 3rd down conversions, and 1-1 on 4th down conversions. After an uncharacteristic torching at the hands of the Pittsburgh Steelers for 538 yards, the defense rose to the occasion, shutting down yet another future hall of fame running back, this time Adrian Peterson (they kept Matt Forte to less than 175 rushing yards back in Week 3), to just total 18 rushing yards. 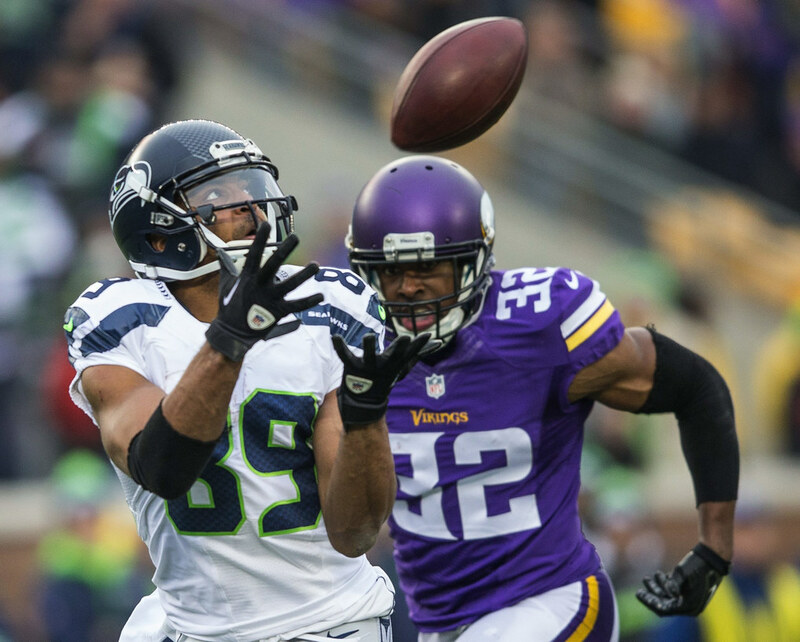 An errant high Viking pass proved an all too easy interception for Earl Thomas, who returned it for 25 yards, would also be the beneficiary of 15 extra yards, thanks to an over aggressive Vikings wide receivers face mask call. Defensive End Frank Clark, who’s been quiet as of this part of the season, lit up Teddy Bridgewater for two sacks. Bruce Irvin and Michael Bennett would sack Bridgewater a single time apiece as well. The longest passes allowed by Seattle was a pair of 21 yarders. The longest rush allowed by Seattle was 12 yards. There were plenty of three and outs caused by the ‘Hawks defense. It was a very Seattle-like showing indeed. Confusingly, the special teams outfit, after notching one blocked punt (and almost having a second one), allowed a 101 yard punt return touchdown to Minnesotas Cordarrelle Patterson. That outfit will look to get back on track this week. Up next for the ‘Hawks is another road game, this time a 1:00PM start in Baltimore to face the Ravens, who at 4-8 are clearly on the lookout to make a statement by limiting Russell Wilson and company to low scores. Baltimore is not far removed from one of its most thrilling wins, a game that included a punt return touchdown and a blocked kick returned for a score to seal a Monday Night Football Victory against the Cleveland Browns. This season the Ravens have lost to Cincinnati by one score, beat Pittsburgh by a kick, held Arizona scoreless in a third quarter, and beat the Rams. This team remains a dark horse, and the Hawks should respond accordingly. For one of the first times in recent memory, the team sustained no injuries to starting players, making them as healthy as could be for yet another crucial road win.